Aaliya warned them that if they tried to come in her or Abhi’s life again then she would spoil them. She asked them to keep Pragya away from Abhi. She came out and saw Purab. She said that she came to meet him only. She held him close and asked him to come on date with her. Purab asked her to leave his hand. Aaliya said that she was not like him, who left her hand. She said that she never hold his hand for leaving. Abhi drank the coffee made by Saira and said what she had made. He got angry on her and said that he wanted a coffee that he liked else he would not be able to do his work. Aaliya came there. Aaliya said that she would get her coffee. Aaliya asked Saira as why she got such bad coffee for Abhi. She replied that she got the best she could. Saira said that Abhi liked coffee made by other receptionist only. Aaliya asked her the name of that receptionist. Saira said she was Pragya. Aaliya was shocked and thought to find out. Doctor came for Pragya’s check up and asked her to walk a little. Pragya tried to walk and said that she was fine. Doctor said that she was alright and she might continue her work. Pragya got happy as she would go to office and meet Abhi. But doctor asked her to take care and not walk too much. Purab dropped doctor. Sarla asked Pragya to not go to office and take rest for some more days. 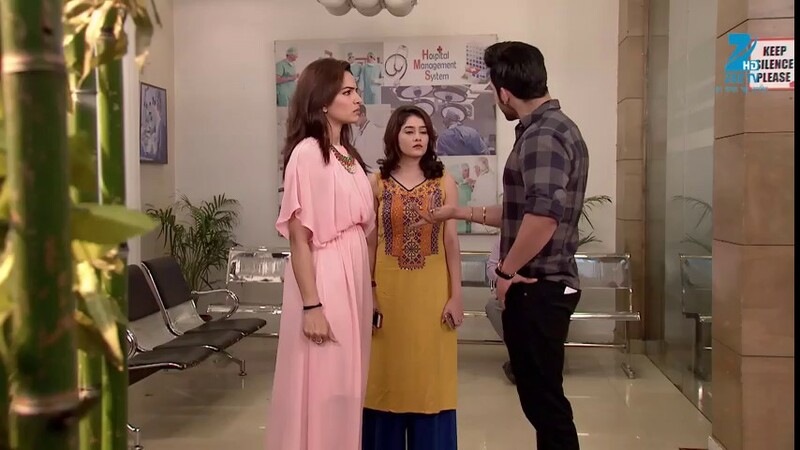 Purab too asked Pragya to take rest. Pragya said that she bored of having rest. Purab said that they could go out for coffee if she was bored. Pragya agreed and asked him to take his car out. They went to a restaurant. Pragya seemed really happy and appreciated weather and atmosphere. Purab noticed that Pragya was that happy after lot more days and thought that something had happened to her. He asked Pragya. Pragya started giving silly reasons. Purab laughed and said that she should always remain happy like that only. Pragya was very happy and wrote something on paper. The paper flies by the wind and got away. Pragya ran to get that paper. Purab came back to the table they were sitting on but thought where Pragya went. He asked he waiter. The waiter told him that she was running outside after some paper. The paper got stuck on Abhi’s shirt. Pragya was surprised to see him there.